As media interest fizzles, the battle at Standing Rock continues. Militarized police destroyed the encampments in North Dakota late last month, but judging by the momentum that lingers, the movement born at Standing Rock is just getting started. The peaceful fight against the Dakota Access Pipeline (DAPL) is still playing out in court, and campaigns against similar pipelines are growing in Washington state, Iowa, Pennsylvania, New Jersey, Oklahoma, Texas, South Dakota, North Dakota, Louisiana, Georgia and Florida. "Standing Rock started with a prayer for clean water. Then it grew into a community of like-minded, passionate individuals who came from all walks of life, different countries, more than 300 Native Nations and all 50 states," he says. "We came for a common purpose, which was to stop the Dakota Access Pipeline, yet we created a family while there. We had daily tasks that became our jobs to make sure everything ran smoothly. We became more in touch with nature and our inner selves." Lott says he learned there is a third option beyond fight or flight. "We no longer have to engage in violence to survive like our ancestors did," he says. "Blood was shed and the ancestors do not want that for us." Like many, I threw financial caution to the wind and was drawn there on two occasions, spending a month total in camp. My greatest fear while driving to North Dakota was getting delayed or detained long enough to lose my relatively lucrative yet skier-friendly jobs. Civil disobedience, it turns out, doesn't pay the bills, regardless of many "professional protester" stories reported by some dubious outlets. During my first visit in November 2016, the main camp was peaceful, prayerful and packed with people. Overwhelmed by visitors and support, Oceti Sakowin Camp stood proudly through eviction orders issued by both the governor of North Dakota and the Army Corps of Engineers (ACoE). 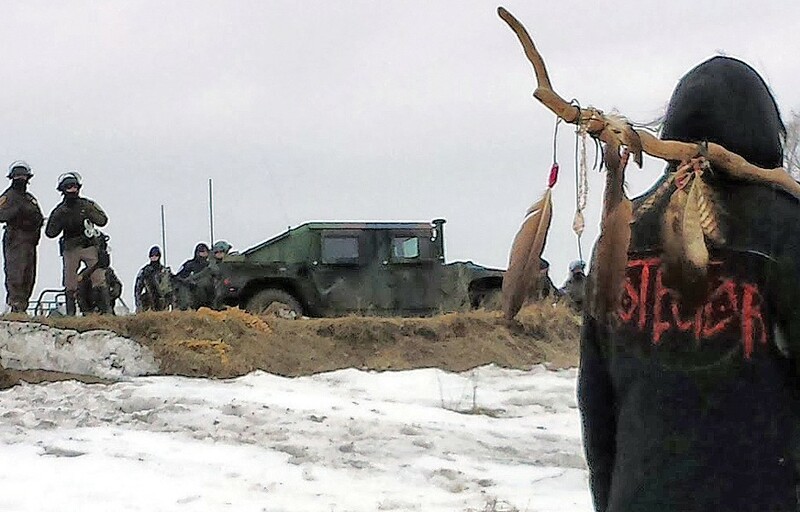 On Dec. 5, the scheduled eviction day, 15,000 people showed up to declare, "Mni wiconi!" (Water is life!) and "No DAPL!" ACoE backed down and pipeline construction temporarily went on hold. The mainstream media showed up just long enough to declare victory for the water protectors. Standing Rock Tribal Chairman Dave Archambault told everyone to go home because the Native-led protests had prevailed. However, thousands of water protectors saw through the façade and stayed on, camping out through a North Dakota winter. As 20-below temps became the norm, most people left their things in camp, vowing to return when the weather warmed. Many people who stayed grew ill, and some blamed it on heaps of Rozol rat poison that had been, according to The Bismarck Tribune, illegally spread on 80 acres directly upwind just across the highway from camp. Despite this and many other hardships and uncertainties, protectors endured the winter. In February, I returned to Standing Rock. It now felt more like a struggling refugee camp terrorized by surrounding security forces. The police had moved much closer, and their floodlights filled the camp at night. ACoE issued another eviction order for Feb. 22, and water protectors called out on social media for help with spring-cleaning. A 10-day heat wave was in the forecast and the government warned that the Cannonball River could flood, so going out to help clean up seemed like the best way to support the movement and protect the local environment. By Feb. 18, most of the camp was a quagmire of mud with deep ruts from heavy equipment used to clean up the camp. The roads through camp had become impassable. Further camp cleanup was seriously hindered after that. Five days later, approximately 200 militarized police invaded and destroyed main camp at Standing Rock. They came in humvees and armored personnel carriers. They wore body armor, brandished tactical weaponry, and barked orders aggressively while creeping through camp. Their snipers scoped us from the surrounding hillsides. Their jamming devices hindered our live feeds. Their helicopter swooped overhead, stalking independent journalists' drones. Their heavy machinery destroyed everything in camp: teepees, tents, sacred sites and even a barn full of tools and equipment. They recorded our faces and actions while they hid behind masks and badges. They followed orders and collected their pay. At the expense of taxpayers, they protected corporate profits from a few dozen peaceful people engaged in my favorite act of civil disobedience: illegal camping. Short of shooting everyone on sight, the police behaved as if bulldozing a village of indigenous freedom fighters half a world away. The only warriors they encountered remained peaceful throughout the ordeal. Miraculously, no one was seriously injured as 47 people were arrested while standing up for clean water and human rights on ground considered sacred for centuries. Some of my friends were among those arrested that day. Fellow journalist Ed Higgins was detained while livestreaming at the front line during the raid. Lott got nabbed while holding space in camp. He described what happened after his arrest. "We were put in cages and stripped to our base layers. Then we were transported for over five hours to a remote prison with our hands zip-tied behind us in freezing temperatures," he said. "The zip-ties were too tight on some and their hands turned blue. We weren't fed for 15 hours, and were blocked from calling our legal support for far too long." 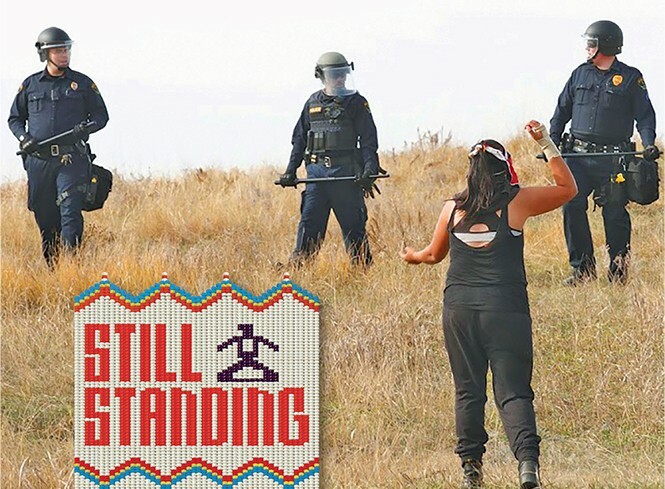 The women arrested that day got treated a bit better, perhaps because a revered Native grandmother walked among them. The rest of us avoided arrest by escaping on foot across the frozen Cannonball River. The only open road to camp had been blockaded by the Bureau of Indian Affairs (BIA) for a week and was closed completely 24 hours prior to the raid. Mainstream news did not cover the raid, instead repeatedly reporting the government's official reason for eviction: supposed imminent danger of flooding from the river, which remains locked in ice till the bitter end. Cannonball is a small river that has only flooded nine times in the last 70 years. According to the National Weather Service, it is not forecast to flood in the foreseeable future. The official reason for evicting the encampment was a lie. It painted water protectors as foolish water polluters. It portrayed the government as ecologically aware and preemptively poised to prevent a minor environmental issue while protecting the construction of a nearby oil pipeline. A few days after main camp's eviction, most of the remaining satellite camps—on private land above the floodplain within the Standing Rock Reservation—were evicted on orders from the Standing Rock Tribal Council. Though the mainstream media paid little attention, the last week of February showcased a shameful spectacle punctuating a months-long siege against a domestic peaceful prayer encampment. Fortunately, during final evictions, police were more restrained than they were during many previous encounters with water protectors. Arguably, the worst of it came on Nov. 20 when tear gas, an LRAD (long-range acoustic device), stinger grenades, rubber bullets and a water cannon were employed. That day, the air temperature was below freezing as police blasted people with cold water for nine straight hours. Law enforcement also shot down three media drones and targeted working journalists with rubber bullets. Sophia Wilansky had an arm nearly blown off by an explosive device, at least 17 water protectors went to the hospital and a few hundred suffered hypothermia. 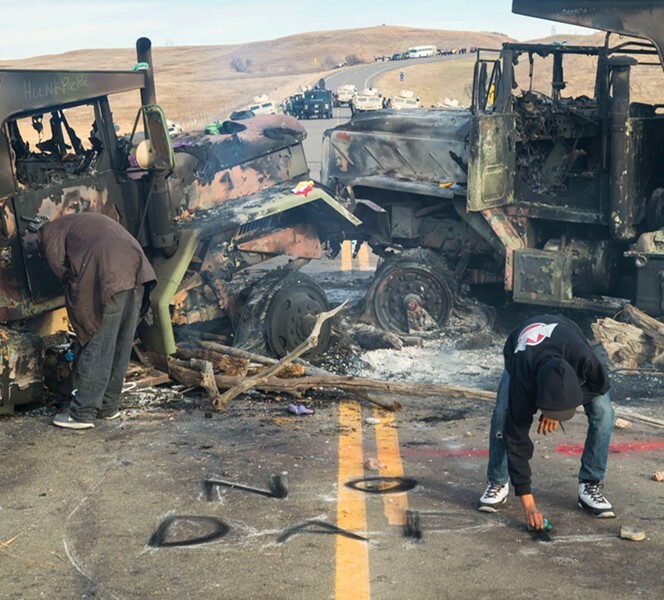 Those attacks targeted water protectors attempting to remove two burnt military trucks blockading the Backwater Bridge on Highway 1806. Police abandoned the trucks there on Oct. 27, and the trucks mysteriously caught on fire that night. Highway 1806 is the main road from Bismarck to the Standing Rock Reservation and its main business, the Prairie Knights Resort and Casino. The closed road hurt the tribal economy, hindered commuters and endangered lives by doubling the drive time from Standing Rock to the closest hospital. Officially, the road was closed because the bridge was "unsafe" due to the burnt trucks. Local government made empty promises to reopen the highway while police simultaneously beefed up their blockade with concrete barriers, razor wire and assault vehicles. Highway 1806 remained closed for more than five months, until March 21. Police and corporate media wrote off protectors as arsonists, never really asking why the trucks were abandoned or who actually set them on fire. Houston-based journalist Derrick Broze filmed the October events, including a group of what appeared to be hired thugs intimidating peaceful protesters before torching the trucks. Broze is a veteran livestreamer who has reported from the frontlines at many police confrontations. That night, he hid in the trees near the bridge because the thugs—not the police—threatened to break his camera and demanded that he leave. He reported for MintPress News: "Although stationed on the water protectors' side of the bridge, a small group of individuals did not seem to hold the same values or practice the same tactics as the larger, Native-led movement against the pipeline. In stark contrast to the water protectors' many actions of peaceful prayer and ceremony, the atmosphere at the bridge the night of Oct. 27 was more reminiscent of an outdoor rave. The people on the bridge set fire to an SUV, and threw rocks and other objects at a row of armored vehicles operated by law enforcement. This small faction of non-peaceful protesters and officers briefly tossed smoke bombs back and forth." Broze recounted that officers eventually lit two smoke bombs on the north side of the bridge before parking two armored vehicles there. All law enforcement vehicles were gone within a matter of minutes, and people climbed aboard the armored vehicles before setting fire to them. The fires, Broze reported, burned throughout the night, as neither law enforcement nor fire department personnel ever arrived at the scene to extinguish the flames. On Oct. 28, water protectors and elders arrived on the scene to retake the bridge from the agitating faction wearing all-black clothing, a tactic for protests and marches known as "black bloc." There were no more than 20 of these provocateurs, Broze explained, and they all traveled together in five older pickup trucks. Several fights broke out on the bridge as the agitators clashed with those calling strictly for prayer and ceremony, and the agitators were run off the bridge within an hour. Broze noted that Sioux—the head of security for the frontline camp off North Dakota Highway 1806—said those who started the fires were not with the water protectors. Apparently intent on forcing their tactics upon the movement, these outside forces appeared uninterested in listening to the Standing Rock Sioux or other Native allies. Although the black bloc tactic has been used as a legitimate way for protesters to shield their identities from law enforcement, it has also been exploited by law enforcement, Broze wrote. "Police masquerading as black bloc activists have been exposed at the 2001 G8 Summit in Italy, at protests in 2007 in Quebec, and police posed as activists to infiltrate the Occupy Movement." Regardless of whether or not the people who burned the trucks were hired provocateurs, police abandoned the trucks knowing that they would be vandalized, and used that to justify closing Highway 1806 indefinitely. These are the underhanded tactics that police resort to while terrorizing people who put their lives on the line performing acts of peaceful resistance. The last time the American police state got this devious and violent with peaceful protesters was in 2011 when the Occupy Movement spread awareness around the globe. In response, a federally orchestrated crackdown swiftly evicted dozens of urban protest encampments that had popped up across America. Evictions were justified by citing public health and safety, just as we saw at Standing Rock. In reality, the Occupy encampments were deemed a threat to national security and financial stability because they raised awareness to the fact that our currency is controlled by a private banking cartel. With near limitless power of the purse, these banksters exert undue influence across the spectrum of civilization. Six years after its zenith, the seeds sown by the Occupy Movement are still growing an enhanced awareness about the corrupt and crumbling foundation of the current financial system, a system that fails to adequately serve the vast majority of humanity and drives the shortsighted investment and development that is decimating nature and life across the globe. However, the weatherworn water protectors still bravely stood up for clean water, challenging the oil pipeline company Energy Transfer Partners in court. On March 7, a federal judge denied a request by the Standing Rock Sioux and Cheyenne River tribes to halt construction of the final piece of the Dakota Access Pipeline. Three days later, water defenders like Lott converged in Washington, D.C., for the Native Nations Rise March. Accompanied by Little Wind, he says the plan is now to "travel to other Water Protector camps around the country to share what we learned at Standing Rock." The DAPL's main purpose is to pump fracked oil from North Dakota to Chicago so it can be shipped overseas. Fracking for fossil fuels pollutes groundwater and causes earthquakes. The pipelines don't do well during earthquakes because all that shaking and shifting can cause them to break. DAPL is designed to ship fracked oil from the Bakken Fields to Chicago at $8 per barrel, $6 less than it currently costs to take it by train. ETP hopes the pipeline will carry 470,000 barrels per day. At a rate of $8 per barrel, the company should gross about $1.4 billion per year on a $4 billion initial investment. It's all about making money, and one way ETP is more profitable is by employing very few people: If completed, the pipeline will only need approximately 20 workers along it's 1,172-mile length. During construction, of course, hundreds of police collected paychecks for sitting around in idling vehicles, terrorizing citizens engaged in civil disobedience, and protecting a private construction site. Meanwhile, water protectors encamped in an impoverished area were criticized for setting up GoFundMe accounts. "I wish everyday Americans could see the sacrifices we made here trying to protect sacred land and water, rather than focusing on the propaganda and drama that surrounds every movement. Thousands came in December to support Indigenous resistance, and this movement has inspired millions. Now that we have been forcibly removed from the camps at Standing Rock, it is time to heal and reflect." "I grew so much emotionally, spiritually, mentally and physically," Lott continued. "Oceti helped me become a warrior and now that the sacred fire has been put out at all camps, it is time to let the fire burn in our hearts and utilize our resources we have gained here, share the skills that were acquired with others, educate people on what to expect if a similar situation threatens their ancestral lands. "It was bittersweet leaving, but I know this movement is far from over. There are thousands of water protectors who will train thousands more. We will defeat the 'black snake.' The prophecy says the Seventh Generation will kill the snake, and that is us. From what I have seen these past several months, our ancestors predicted certain situations from the unification of the condor (South American Natives) and the eagle (North American Native), to the rise of the Seventh Generation, to the Rainbow Nation joining forces with the Red Nation. All of that happened at Standing Rock, and now it is time to make our ancestors proud." Out of Standing Rock, the birth of a new environmental movement emerges. It is snowing in Washington, D.C.—strange in early March after an insanely warm winter, but nothing compared to the cold many of the activists and tribal members gathered here endured in North Dakota while fighting against the construction of the Dakota Access Pipeline. Kristen Tuske, a 39-year-old Sioux woman from the Standing Rock Sioux Reservation, stands with several other women in front of the White House, her back to it, fist raised in the air. She has pink hair, sculpted arches for eyebrows and tattoos on the side of her face. She lived at the camp where thousands of "water protectors" gathered to fight the pipeline for seven months. "The last couple weeks at the camp were sad and everyone was a little angry," she said. "A lot of feelings are hurt ... That was our home and we got kicked out." February's camp evacuation might be a defeat for Standing Rock, but, in the eyes of those gathered in front of the White House, it might also signal the beginning of something greater—the possibility of a real environmental movement in America. "The reason I am here is to represent our future generations and be their voice, part of the resistance in decolonizing our minds," said JoRee LaFrance, a member of the Crow tribe from Montana. "Protecting our waters should be our No. 1 priority, and that's why we're all here is to unite and protect tribal sovereignty and to protect indigenous people and their waters. People need to realize indigenous people are doing this for all people, not just indigenous people. We're here to protect the water for all people." That sentiment was heard again and again. It is not just about the water at Standing Rock. It is a symbolic battle, a turning point. The indigenous people are stepping forward to save the planet—and to save us from ourselves. Little Thunder, an elder from South Dakota's Rosebud Indian Reservation, is standing apart from the crowd in full ceremonial regalia: a feathered headdress, a circular feather shield and some mirrored sunglasses. He came all the way to Washington to "let people know and let Trump know that this is not just a Standing Rock or a Washington, D.C., or a politics issue. This is for the whole earth. We're trying to save the water because water is life." Little Thunder says he is a single father of six children, four of them living at Standing Rock. His voice is high and pinched; he's almost singing as he speaks. "Once he let [Standing Rock] go through, they think they can destroy the water, which is life every place else on this earth, not just Standing Rock," he says. David Kenny, a member of the Seneca Nation, is standing with a sign that reads "Water is Life." "It's not just about Native Americans anymore. It's about everyone," he says. "Because you keep poisoning the water, you're going to start paying for it and they're going to shoot that price up. You're going to be paying $20 for a bottle of it. It's not just about the tribes anymore." He turns his attention toward the White House and the white man inside it. "Can you stop this pipeline, please?" he asks in a soft tone. "It's not about business anymore. It's not just us that's going to fall—it's you, too. Everybody is going to die if this continues. The earth is dying." 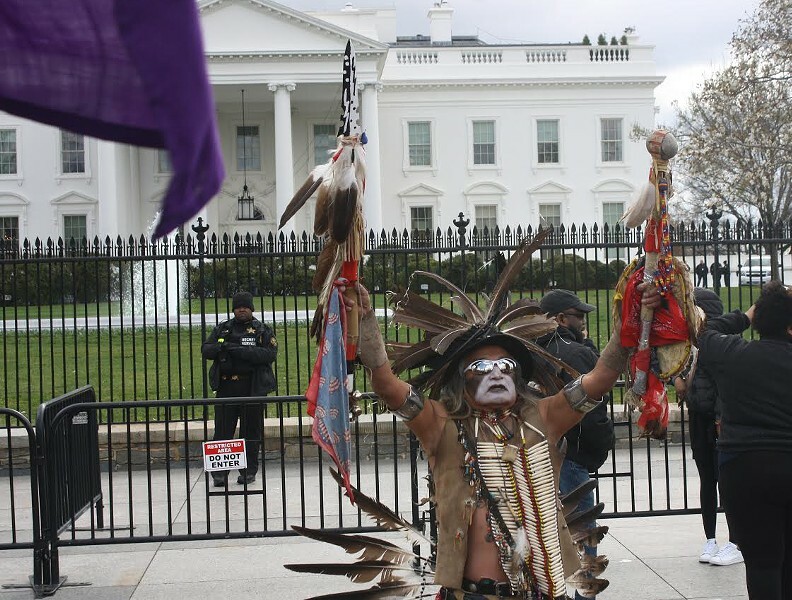 There is no indication that Trump or anyone else in the White House hears this, despite the fact that native nations have spent the last four days with teepees set up on the mall, raising awareness of indigenous and environmental issues. On March 9, the day before the gathering across from the White House, Environmental Protection Agency Administrator Scott Pruitt said he would not agree that climate change caused by human activity is "a primary contributor to the global warming that we see." But as the Native Nations Rise rally went down, thousands of more people were calling the EPA to complain about Pruitt's disavowal of accepted science. On the same day as the rally, the National Oceanic and Atmospheric Administration released a study reporting that carbon dioxide levels rose at a "record pace for second straight year." "The two-year, 6-ppm surge in the greenhouse gas between 2015 and 2017 is unprecedented in the observatory's 59-year record," the report read. Trump's budget proposal, released a week after the rally, slashed the EPA by more than 30 percent. NOAA is not included in the final proposal, but a leaked draft showed a 17-percent decrease in funding. The snow falls on the demonstrators and the dancers and the speakers on the stage. Taboo from the Black Eyed Peas takes the stage. 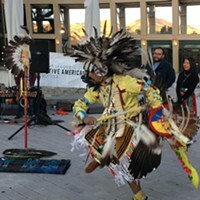 He is part Shoshone and organized the release of a song recorded by a collection of mostly native artists to bring attention to Native American issues. It is still a strange moment, watching the snow fall as this pop star in a floppy hat sings over a recording of his band's song "I Gotta Feeling" and people sway and dance and sing along, making it feel, for a moment, more like spring break than a deadly serious fight for the fate of the world. Looking over at the White House, I have a feeling that tonight's probably not gonna be a good night; but if we listen to the water protectors, we might still have some good ones left. As four states finalize approval of the $3.78 billion Dakota Access Pipeline, Native Americans from the Standing Rock Sioux Tribe petition the federal government. The 1,172-mile-long underground pipeline will carry crude oil from North Dakota to refineries in southern Illinois, crossing two additional states en route. The Sioux say the pipeline will interfere with sacred burial grounds and compromise their water supply. The U.S. Army Corps of Engineers signs off on the pipeline project. Soon afterward, Sioux leaders start to organize near the Standing Rock Indian Reservation, 3,500 square-miles of tribal land that straddles the North Dakota and South Dakota border. Camps are set up near the Standing Rock Indian Reservation that put protesters, or "water protectors" as they call themselves, in proximity to a construction blockade. Numerous other Native American tribes join the Sioux. Demonstrations are met with militarized police action, and in turn, allies from across the country travel to Standing Rock to support the resistance. A couple of film students from Salt Lake Community College make the journey to North Dakota to document the protest. One of them, a member of the Blackfeet and Shoshone-Paiute tribes, makes his way to the front line to film a clash with police. Water protectors are finding solace in cities across the country. As a protest on Salt Lake City's Main Street winds down, demonstrators flood into the Wells Fargo Center lobby. Security kicks most of them out, save for a few souls who chain themselves together. Some of the occupiers reinforce their entrenchment with U-locks around their necks. The eight or so individuals are eventually freed, cuffed and hauled to jail. All the while, supporters outside sing a soulful protest song. 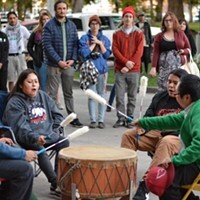 While declaring November Native American Heritage Month, Salt Lake City Mayor Jackie Biskupski professes support for the water protectors. She also joins leaders from a handful of American cities in opposition to the Dakota Access Pipeline, and her name is added to a letter bound for then-President Barack Obama. In a Q&A with City Weekly, PANDOS member Carl Moore explains why Utahns should be concerned with the Dakota Access Pipeline. "This is not a native issue," he said. "The native people are leading this issue, but this is an issue of clean water, respect and dignity—a matter of sacredness." At an apparent impasse, Standing Rock is quiet for the holiday. City Weekly contributor Lori A. Wagner describes her experience at a camp over Thanksgiving. The months-long conflict has remained on the public's radar due to notable casualties, including an episode where a protester, purportedly hit with a concussion grenade, nearly loses an arm. With a little more than a month left in office, the federal government halts completion of the Dakota Access Pipeline. The Army Corps agrees to explore the option of diverting pipe along a new route to avoid running a line below the Missouri River. Co-founder of the Utah League of Native American Voters Moroni Benally posts a video on Facebook after he delivers to Standing Rock a letter of support from Salt Lake City leaders. "This decision is important as it affects the entire infrastructure development in Indian Country," he says. "It's a victory for Tribal sovereignty, and it will set precedent for development of fossil fuel infrastructures on federal and Indian land for the future." Four days after he is sworn into office, President Donald Trump signs an executive order reviving the Dakota Access Pipeline, as well as the Keystone XL Pipeline, another oil infrastructure project Obama rejected. In a year marked by protests and demonstrations, a local NoDAPL rally adds its voice on a frigid winter evening. The gathering is in direct response to Trump's executive order, seen as an undoing of environmental policy by the previous administration. Facing the steps of the Salt Lake City and County Building, residents wave signs, chant slogans and cheer on an organizer's cry recognizing the need for diverse and thoughtful candidates to challenge the political apparatus.